Ningbo resident Wang Jinyu devotes herself to ancient and invaluable Chinese scripts and publications. Just as Ningbo resident Wang Jinyu found a new career after being a Chinese opera actress, she provides the same opportunity for a second life to ancient and invaluable Chinese scripts and publications. A 30-year veteran of restoring centuries- old parchments and books, the 55-year-old Wang has saved countless invaluable items from extinction through her meticulous salvage work at Tianyige Museum in Ningbo’s Haishu District. Her mission involves assessing the level of deterioration of printed or scripted texts that could be hundreds of years old. She then decides the complexity of the required recovery procedures and sets her staff to work. Wang recently applied her time-honored craft to gently and carefully restoring three Jinshi lists which were originally glued to a wall in Yinzhou District during the Qing Dynasty (1644-1911). Despite the careful efforts of experts in peeling them off the wall, the three lists were inevitably frail and their preservation became the greatest challenge of Wang’s career. The lists served as the official announcement of candidates honored with Jinshi, the title given in ancient China to people who had passed the final palace exam, the ultimate imperial assessment after candidates had passed local and provincial tests. They were important records of the examination era, a civil service system practiced in imperial China to select candidates for state office. Wang is a prime example of China’s modern class of ancient book restorers who distinguish themselves through preserving the written records of history for use in future research and cultural studies. Wang Jinyu, a 30-year veteran of restoring centuries-old parchments and books at Tianyge Museum, has saved countless invaluable items from extinction. Tianyige Museum is the modern day survivor of the oldest library in Asia and is one of the three most important private libraries in the world. 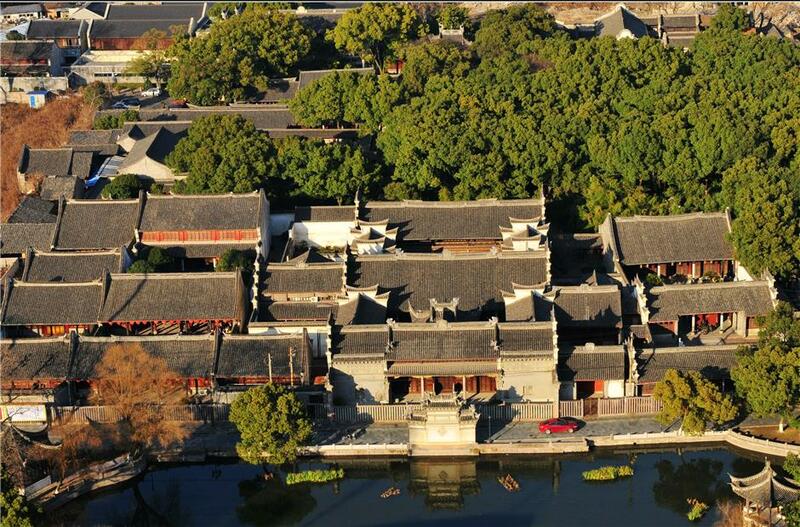 It was built for personal use by Fan Qin in 1566 during the Ming Dynasty (1368-1644). Fan Qin was a recipient of the Jinshi title and won higher office in China. The Tianyige Museum today houses a collection of mainly Ming Dynasty books and records of imperial examinations and transcripts. Eighty percent of existing imperial examination records are held in the museum and 90 percent of them are the sole existing copies. The value of the collection in Tianyige Museum cannot be overstated as it directly contributed to completion of “Siku Quanshu (meaning Complete Library of the Four Branches),” the largest collection of books in Chinese history. “Siku Quanshu” is the foremost ancient Chinese encyclopedia. It was written and edited by about 360 officials and transcribed by 3,800 people over 13 years. Emperor Qianlong (1711-99) commissioned the encyclopedia in 1772 and Fan Maozhu, a descendant of Fan Qin, made available 638 different books from the Tianyige collection as references. Qianlong then constructed seven libraries in China that replicated Tianyige, four in north China and three in the south. Their purpose was to house the seven copies of “Siku Quanshu” in tribute to Tianyige. “There are about 150,000 volumes of ancient books and nearly 300,000 chapters preserved in Tianyige Museum,” Wang said. “Eighty thousand chapters are rare copies in good condition but a lot of the collection is in need of restoration,” she added. Wang defines ancient books as those written and printed before 1912 in the traditional Chinese binding style such as juanzhou, scrolling papers together to form a book. Tianyige Museum, the modern-day survivor of the oldest library in Asia, is one of the three most important private libraries in the world. It was built in 1566 during the Ming Dynasty. Tianyige Museum has 14 ancient book restorers on staff, including Wang, three of whom work in laboratories doing chemical analysis of ancient papers and studying ancient book preservation methods. Women are the main experts working on book restoration at the museum. The restoration work requires patience, prudence and experience, as well as a devotion to study and research. Wang and other restorers work in a three-story building in the Tianyige complex. There are three restoration rooms on the third floor, with four to five restoration benches in each room. The room temperature needs to be kept at a constant 20 to 22 degrees Celsius. Another room has three long and broad tables that are used for mounting papers. This involves a consolidation process in which new complete papers are pasted on the back of paintings and calligraphies. Wang’s desktop features the simple tools of her trade, including calligraphy brush, tweezer and watering spout. The materials used for restoration are similar to those from which the ancient documents are made, such as bamboo and tissue. Bookbinding cords include silk, linen, and cotton thread. Wang illustrated two key steps of the methods of ancient book restoration. The first involves “restoration after dampening” to rehabilitate papers with holes. The paper is dampened with sprinkles from the watering can to straighten it out. A paste is then brushed around the edges of holes and new paper is stuck on. The restorer then tweezes the added layer into place, coaxing it to blend with the original area. “This is the core step of ancient book restoration and also the most difficult part,” Wang admitted. “Chinese book restoration techniques are highly respected around the world. I noticed when visiting Japan that their restorers don’t manually brush on the restorative pastes. Instead they directly apply paper pulp which is then integrated through a machine. “Though we also have these machines, we still stick to traditional pasting methods,” she emphasized. The second key step involves “restoration for consolidation” to deal with the brittle parts of papers. Restorers brush a paste directly onto the brittle area, apply new paper and then press and remove the superfluous parts. This method is similar to restoration of paper holes but without the dampening. Wang shows two key steps of restoring ancient books. The first involves “restoration after dampening” to rehabilitate paper with holes. The second involves “restoration for consolidation” to deal with the brittle parts of paper. Wang emphasized it is not easy to describe the regular workload of a restorer at every library. The work they do depends on the condition of ancient papers they are trying to restore. If the papers have severely deteriorated, only one or two items might be salvaged by a restorer in a day. However, if there is only slight damage, 15 to 20 items can be repaired in a day. 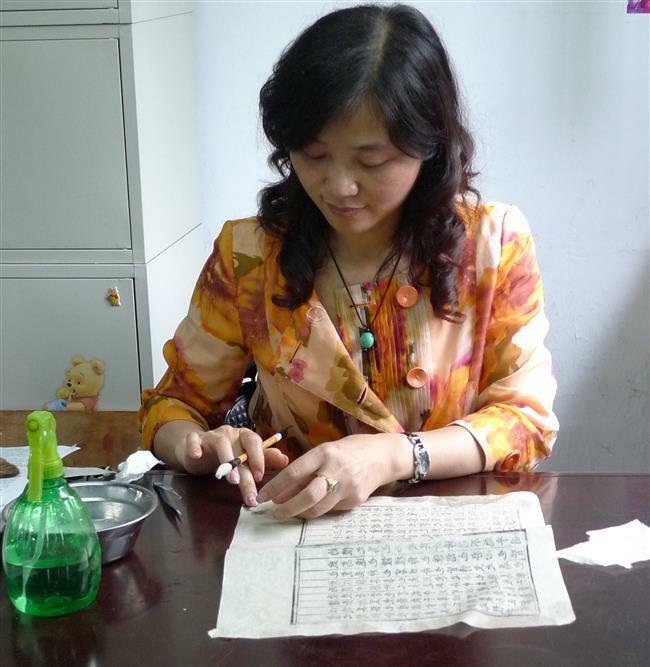 Wang and her restoration colleagues at Tianyige Museum have revived a total of 7,805 pieces of inscription rubbings in the past two years. Wang’s path to a career in book restoration was not predetermined. She had an early working life as a local opera actress in Ningbo but when the cast numbers were reduced, she was reassigned to do painting and calligraphy mounting at Tianyige Museum. Her work as a restorer of ancient books developed gradually from then. She said that while book restoration is a craft, it also requires a knowledge of science, particularly the chemical properties of papers. “Before restoration, we have to first measure the pH value of papers,” she explained. “This is because through acidification over many years, papers end up with a low pH value. We therefore need to wash them with distilled water to improve their acid level to a pH value of 7 to 8. This is an ideal level for paper preservation. “If the distilled water cannot wash out the acidity, baking soda used for making steamed buns can be added to the water to increase the paper’s pH value,” she added. “Huanyu Tongzhi,” a Ming Dynasty encyclopedia of geography, was one of the largest ancient books ever restored by Wang and her team. It consisted of 41 volumes, 112 chapters and a total of 2,010 pages. The pH level of this huge book was increased from about 4.7 to 7.2 after restoration. Director of the local history section, Gong Liefei, said Tianyige Museum’s collection is not the largest in terms of total quantity. But it has the biggest collection of regional local history in the world. For example, 35 percent of documents and books in China relating to the Ming Dynasty are preserved in Tianyige Museum. “Tiansheng Ling (ling meaning statutes in Chinese)” is a regulations list of ancient Chinese administrative laws which were enacted by Emperor Ren Zong in the 7th year of the Tiansheng Period (1023-1032) of the Northern Song Dynasty (960-1127). The transcription of the “Tiansheng Ling,” which was copied in the Ming Dynasty, is now held by Tianyige Museum. As the Northern Song Dynasty’s lawmaking was based on laws of the Tang Dynasty (AD 618-906), “Tiansheng Ling” actually includes the regulations lists of both dynasties. The combined product includes 293 statutes of the Song era and 221 statutes of the Tang era. It is a rare and invaluable product as some statutes cannot be found in other historical records. For example, there is a Tang statute decreeing that a gynecologist should be a female aged between 20 and 30. This had never been previously regulated. “Mingshi Gao,” a history of the Ming Dynasty through a series of biographies, was compiled by Wan Sitong, a famous scholar in the Qing Dynasty (1644-1911). The “Mingshi Gao” volume held in Tianyige Museum is the sole remaining manuscript of Wan and is the earliest existing version of Mingshi history books.